This post is sponsored by Mud Pie Market. All opinions are my own, as always. It’s the most wonderful time of the year–the holiday season is upon us, which means Black Friday is almost here! 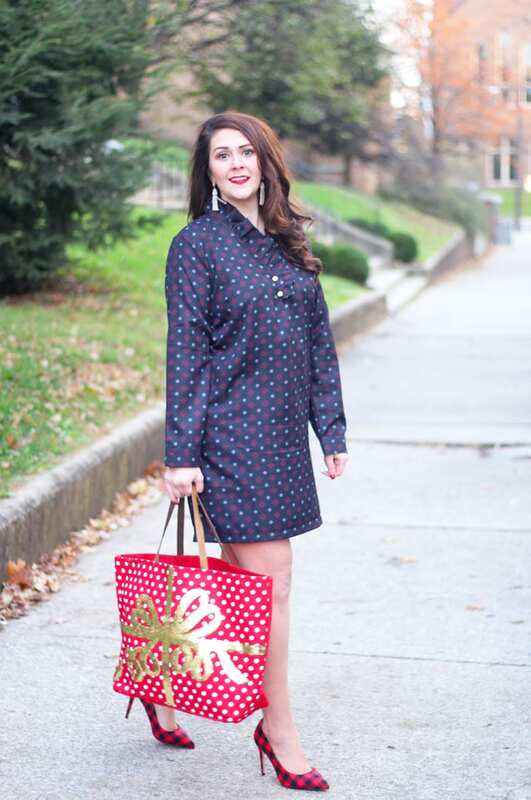 I’m excited to kick off my Black Friday deals posts this week with this holiday party look from Mud Pie Market! Check back tomorrow for a comprehensive Black Friday guide to see my Black Friday sale round-up and see how I score the best deals! Y’all know I love being festive around the holidays! 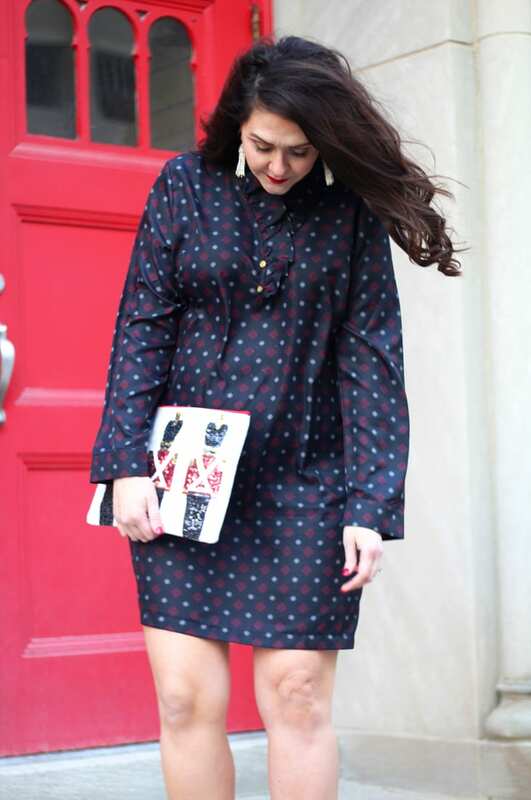 This Whitney dress from Mud Pie Market is great for a holiday party. 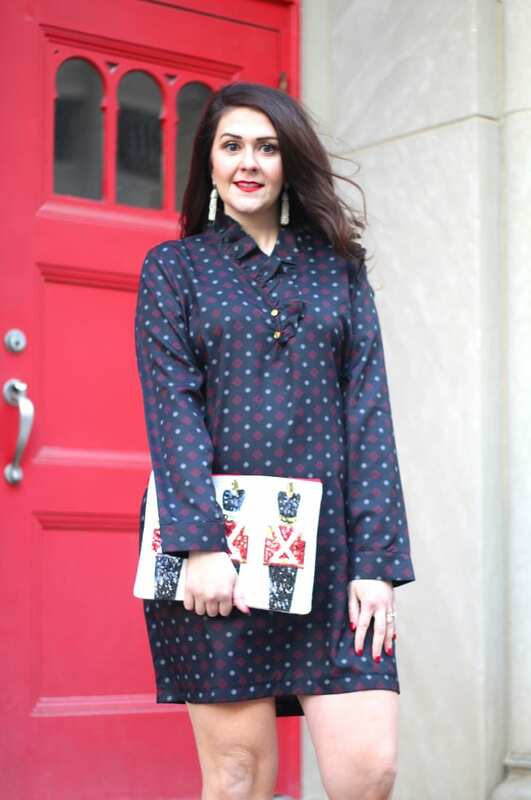 I love the ruffle detail around the neckline, and the pattern has a nice pop of red. This dress is non-maternity in a size L. Personally, I think this dress runs a little big, and it’s still accommodating my 23 week bump. The material is silky and comfortable to wear. 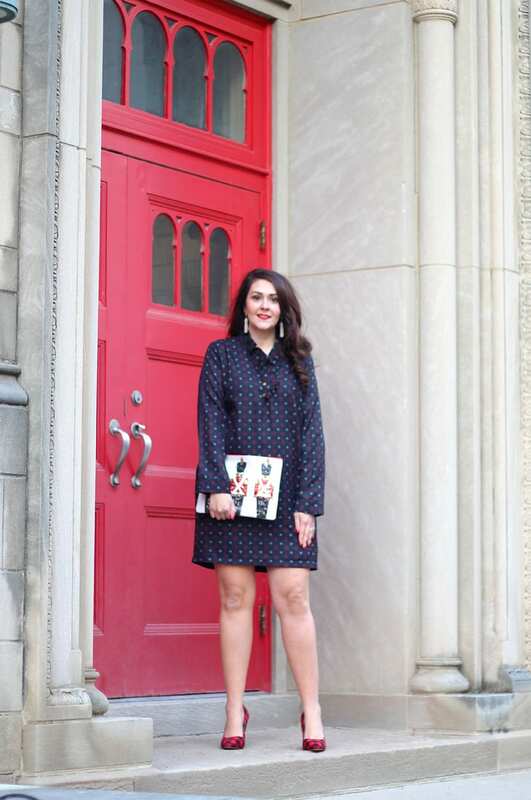 To bring out the pops of red in the dress, I slipped on my buffalo plaid heels. This pair is sold out, but I linked a similar plaid pair above that’s on major sale. Also, where this dress has a statement neckline, I opted for a pair of statement earrings as opposed to a necklace. For the perfect holiday accent to my outfit, I added the Mud Pie jute clutch in the Nutcracker motif. How cute is it, especially if you’re going to see the Nutcracker?! The jute clutches are all under $10, and I adore the sequin detail. If you’re heading to a party where you need to take gifts, then you can carry the Mud Pie jute tote instead. At under $20, this oversized tote will have room to carry presents and other party items so that you don’t have to try to juggle a bunch of stuff in your hands. Mud Pie Market is going to have some AWESOME Black Friday deals. Beginning at 8 a.m. eastern time on Black Friday (11/24) Mud Pie Market will be running the following Black Friday deals: take 20% off $50, 30% off $75, and 40% off $100 when you use “BFDEAL“. Plus, Mud Pie Market will be offering free shipping on orders of $25+! This is an excellent time to snag my holiday outfit, or any presents you may need. Mud Pie Market has some great Christmas items right now too, including this Baby’s 1st Christmas ornament. 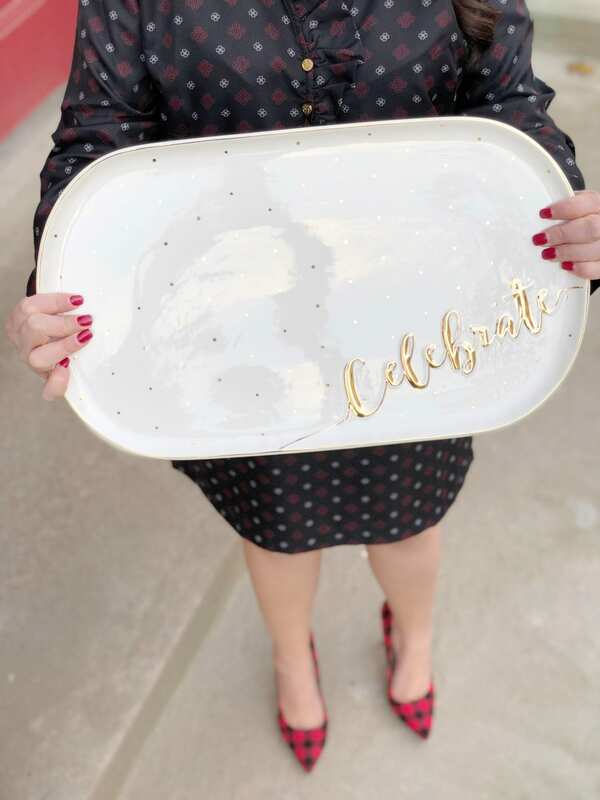 I’m in love with this Celebrate platter, which will be perfect for setting out Christmas cookies! 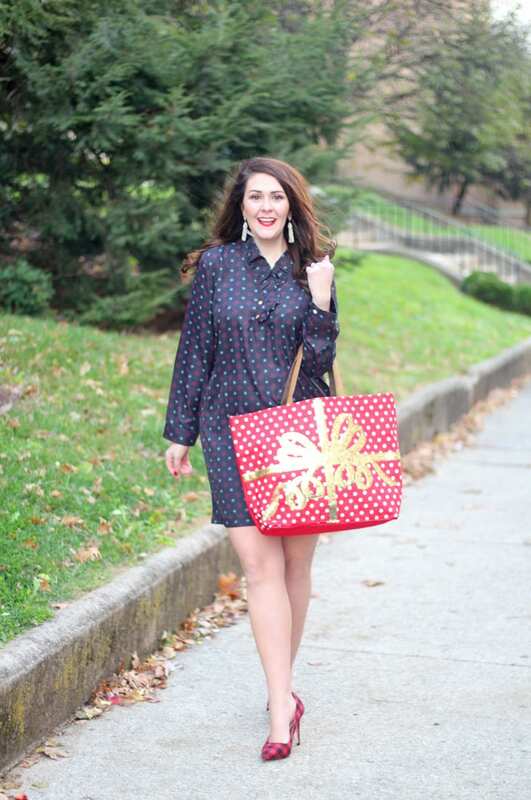 This is such a pretty and classic holiday look! I love everything about it, especially that Nutcracker tote. So darn cute!! I love the print on that dress and the ruffle detail! And seriously, those pumps are perfect!! The pattern mixing works so well, but I can totally see these with a great pair of jeans and a tee too! love it! 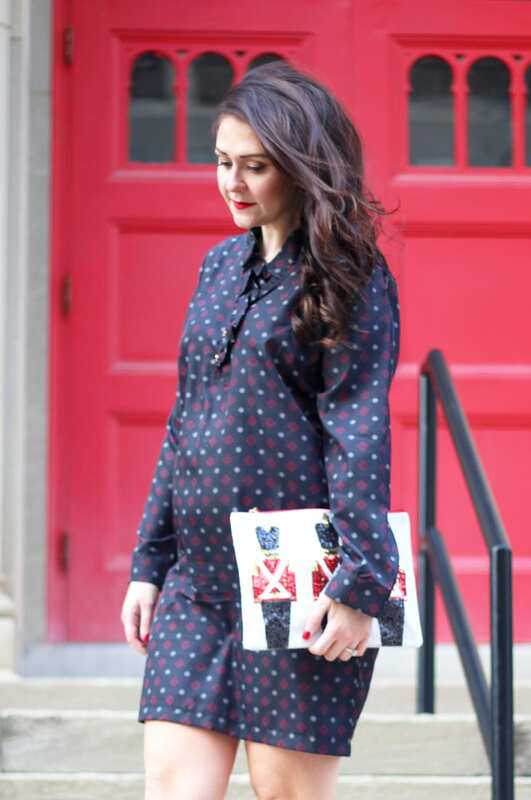 Loving the pattern mix and your bump is precious! Such a cute dress! Love the name Mud Pie too! Love your dress! It’s super cute and so is your baby bump, of course! You look so darn cute! Love the dress. What a cute look! I love the shoes! This outfit is super cute!! Your little bump is darling and I love that festive bag! You look so beautiful!! I am loving that pretty dress!! I love this outfit so much!! That dress looks amazing on you!! How fun are these holiday pieces? The tote bag is my favorite. 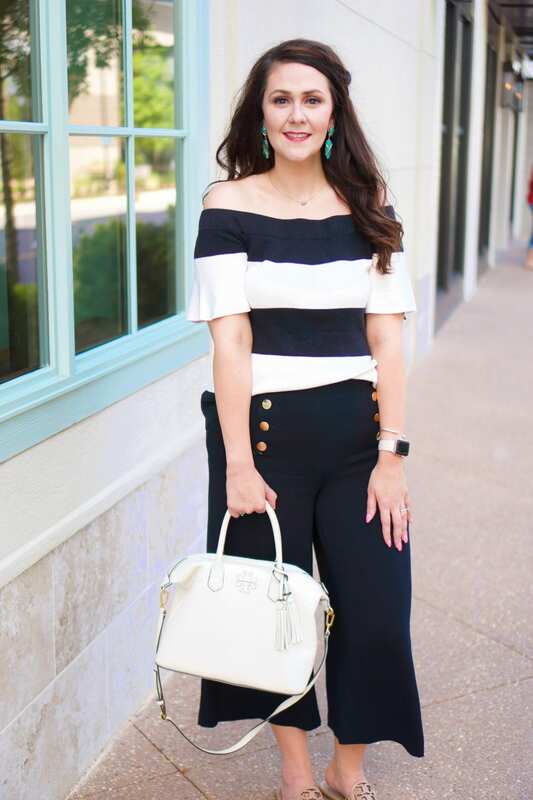 How precious is that nutcracker clutch? So many festive pieces! I love this outfit! What a fun mix!